The city's ambulance companies, which are mostly family-owned small businesses, are already in a tight economic situation. 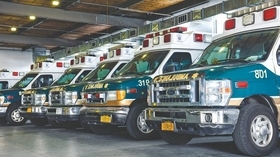 Envision Healthcare's long journey to sell its giant ambulance business has culminated in a $2.4 billion deal with a Kohlberg Kravis Roberts & Co. operating company, the companies announced Tuesday. Under the deal, Envision's American Medical Response will be combined with KKR's Air Medical Group Holdings to create a medical transportation behemoth serving more than 5 million patients annually across 46 states and the District of Columbia. Envision, which merged with Amsurg last year, signaled early this year that it would sell AMR to concentrate on its larger and faster-growing physician staffing business. The company listed AMR's performance as a discontinued operation last quarter. "The agreement delivers on our commitment to continue the proud tradition of AMR and enables Envision to focus on its physician-centric strategy and ongoing services," said Envision CEO Chris Holden. The combined new transportation company will be renamed to reflect its ability to transport patients by air or vehicle, KKR said. AMR President Randel Owen has been named the CEO of the new company. The deal is expected to be completed in the fourth quarter subject to regulatory approvals. In a note to investors, Cannacord Genuity analyst Richard Close said Envision plans to use half of the $2.4 billion in cash proceeds to repay debt and half for additional acquisitions. Envision is the nation's largest physician staffing company to hospitals with 19,000 doctors and advanced practice clinicians serving in various hospital departments, including the emergency room, radiology and anesthesiology. The company's revenue this year is expected to be about $10 billion. The all-stock merger between Greenwood Village, Colo.-based Envision and Amsurg in Nashville last December allowed the combined company to surpass the previous leader in physician staffing, TeamHealth of Knoxville, Tenn.
TeamHealth was bought by private equity player Blackstone Group earlier this year. KKR last month bought another healthcare company, WebMD.